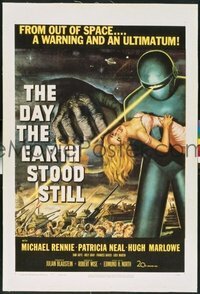 #276 DAY THE EARTH STOOD STILL linen one-sheet movie poster '51 classic!! Lot #: #276 DAY THE EARTH STOOD STILL linen one-sheet movie poster '51 classic!! the poster had an area of paper loss at the top crossfold (around the size of a penny; fortunately, it is in the sky background are, so it is a very unimportant part of the image) and tiny paper loss at the crossfold; there were some small tears and tiny areas of paper loss in the vertical foldline; there was a tiny area of paper loss in the right of the top foldline; there were some minor defects along the horizontal foldlines and some minor border defects. Overall, this was a pretty nice example of this poster prior to linenbacking. It was very nicely linenbacked, and looks great!